The HD2VGAMM6 6ft HDMI to VGA converter cable lets you connect your HDMI equipped Chromebook, laptop or desktop to a VGA monitor or projector, with no additional adapters or cables required. The HD2VGAMM6 converter cable delivers a precise 6ft connection that eliminates the clutter of excess cable length and ensures a tidy, professional installation. For longer shorter installations, we offer a 3 ft HDMI to VGA cable (HD2VGAMM3), and longer installations we offer a 10 ft HDMI to VGA cable (HD2VGAMM10), enabling you to choose the right cable length for your installation needs. Reduce clutter with short 6ft adapter cable. Avoid the hassle of additional adapters or cables with a built in cable connecting an HDMI video source directly to a VGA monitor or projector. Save upgrade cost by connecting your HDMI computer to a VGA monitor or projector. Supports video resolutions up to 1920x1200/1080p. Active digital HDMI to analog VGA conversion. 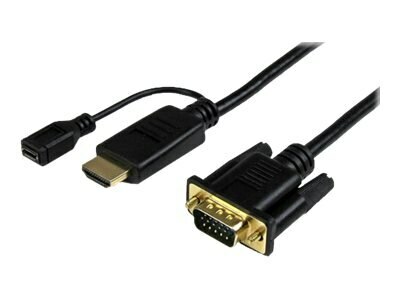 Adapter and cable in one, with 1x male HDMI connector and 1x male VGA connector.